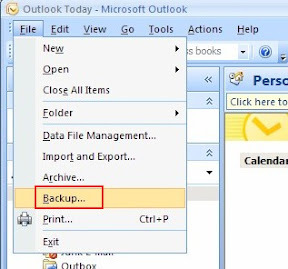 If your using PST (Personal Storage Table) in MS Outlook to store your mail, notes, contacts, tasks and calendars then you might want to backup copies every now and then. With PF Backup from Microsoft, you can create backup copies of your .PST files at regular intervals. You can choose which of your .PST files you wish to back up, and how often you wish to back them up. 2. On the File menu, choose Backup. 3. To change the backup options, such as which .PST files to back up, click Options. This Add-In is compatible on Microsoft Outlook 2007/2003/2002.